This title was first published in 2002. On the eve of the first centenary of Lenin’s, What is to be Done?, this book provides a critical assessment of the theory and practice of revolution at the start of the new millennium. The volume shows the pertinence of revolution in our post-socialist world and provides a focus for critical social inquiry, revealing the significance of the theory of revolution and its practical meaning. By identifying the weaknesses of orthodox accounts into social and political change, it offers a timely reassessment of the left-communist critique of Leninism and shows its contemporary relevance. Against the background of the globalization of capital, anti-capitalism has to dream revolution. The book shows the practical and theoretical meaning of this dream: the society of the free and equal. Contents: What is to be done? 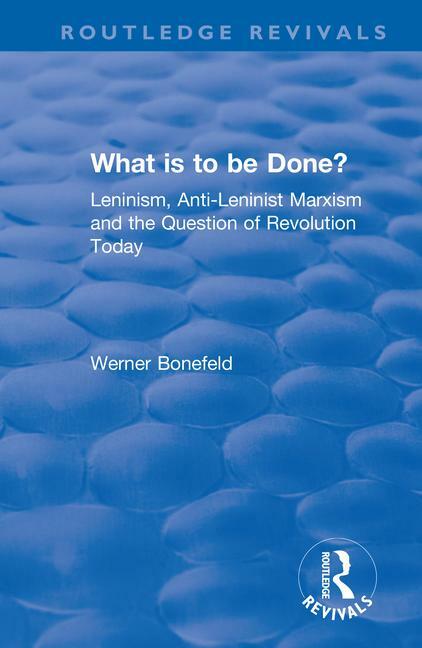 Leninism, anti-Leninist Marxism and the question of revolution today, Werner Bonefeld and Sergio Tischler. What is to be Done? In Historical and Critical Perspective: Kronstadt: proletarian spin-off of the Russian revolution, Cajo Brendel; Perspectives on left politics: on the development of anti-Leninist conceptions of socialist politics, Diethard Behrens; Was Lenin a Marxist? the populist roots of Marxism-Leninism, Simon Clarke; The dialectic of labour and human emancipation, Mike Rooke. What is to be Learned? Contemporary Capitalism and the Politics of Negation: The command of money-capital and the Latin American crises, Alberto Bonnet; State, revolution and self-determination, Werner Bonefeld; Lenin on the production of revolution, George Caffentzis; The crisis of the Leninist subject and the Zapatista circumstance, Sergio Tischler. What About Revolution? Ends and Means: Emancipation: paths and goals, Johannes Agnoli; Revolt and revolution or get out of the way, capital!, John Holloway; Index.